The clear plastic wrap used to keep your foods safe could be hazardous to your health. Researchers have discovered that trace chemicals found in plastic products are responsible for an assortment of medical conditions. As a result, many manufacturers have altered the materials used in their plastic products; however, not all companies have made these changes, and some of the replacement materials may not be as effective in preserving your food. Polyvinyl Chloride -- or PVC -- is widely used in office and medical supplies, outdoor items, clothing and as packaging for personal care products. It is also used in cling wrap, plastic wrap, plastic containers, drinking straws and grocery store bags. According to both the Institute for Agriculture and the Ecology Center, exposure to PVC can cause birth defects, skin diseases, cancer and deafness, as well and liver and spleen problems. Bisphenol A – or BPA – is another chemical used in plastic wrap, plastic sandwich bags, plastic containers and soup cans, among other items. According to the Environmental Working Group, “Low doses of BPA lead to a range of health problems, including birth defects of the male and female reproductive systems in laboratory animals.” S.C. Johnson, the manufacturer of Saran Wrap stated on its website that it does not use BPA in its products. Heating or microwaving plastic increases the chances of releasing chemicals into food. Kellogg Schwab of Johns Hoskins Bloomberg School of Public Health, states, “Microwaving food in contact with plastic wrap is another potential source of exposure, but a few years ago manufacturers in the U.S. replaced PVC plastic wrap with low-density polyethylene (LDPE).” However, Schwab warns that plastic wrap made in other countries, or categorized for nonfood use, may still contain PVC. Good Housekeeping gathered several brands of plastic containers, wraps and bags to test their poisonous chemical content levels. Only one of the clear plastic wraps, Glad Press N Seal Multipurpose Sealing Wrap, contained low levels of BPA and the chemicals found in PVC. However, during a test with simulated food, none of the chemicals were transferred from the plastic wrap or the other containers to the simulated food. 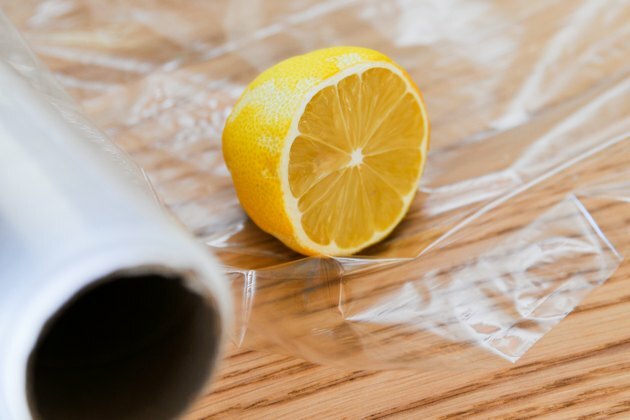 The original plastic wrap made of PVC had more clinging capabilities, but because of health concerns, some manufacturers switched to a food-safe version of PVC and others started using LDPE. However, "Cooks Illustrated" performed several tests on the clingability and air- and water-tightness of the wraps and concluded that there is a trade-off with both types of wrap. The PVC wraps cling much better, but do not stop air and water from invading the container. The LDPE wraps don’t cling well, but they are impermeable. Which Plastics Are Safe to Use as Containers to Grow Food?